Skyros is an island embraced by the blue Aegean waters and lush greenery creating breathtakingly beautiful images. Whether you are looking for a destination for relaxation or full of activities and adventure, Skyros is the right choice for both. The island has many small family-run hotels and apartments and activities centres. Skyros is a beautiful island of the Aegean Sea and is located in the southernmost of the Sporades Complex. It is a magnificent, green island. It is characterized by strong contrasts, as it offers rocky mountains and fantastic beaches. These contrasts are ideal for those who like climbing, wind surfing, biking, water-skiing, off-roading. Among the locals, the northern part is called "Meroi", which is green with lots of pines and the southern part of the island is called "Vouno" and is full of rocks. It is a place with vivid tradition, hospitable people and unique atmosphere. Relaxation, adventure, culture are combined perfectly in Skyros. The island of Skyros is a typical greek island. Most of the villages in Skyros have small houses that preserve a traditional decoration. The folk art especially pottery and wood carvings furniture, is a main occupation for the locals. These local crafts are widely known and most of the time this specific style is called Skyrian. Also in Skyros island are organized carnibal celebrations. According to the legend, Skyros is the place were young Achilles was hidden and where Theseus was killed. In Byzantine times, Skyros was an island of exiles, who had established collaboration with invading pirates. The tomb of the English poet Rupert Brooke who died in the First World War is also here in Skyros. 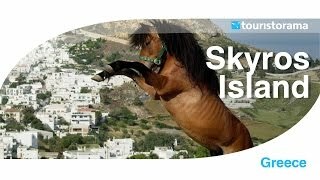 Skyros is also the home of the unique breed of local horses, the Skyrian Ponies. It is believed that they are descendants of the ancient horses and they survived here because of the remote surroundings. Skyros spans an area of 223 sq. km. with a total population of 2.602 residents. It is located near Euboea across the port of Kymi on the west and Alonnisos Island on the northwest. The capital of the Island is called Chora and is built on the “Rock of Theseus”, the rock off where Lycomedes threw Theseus after he had lost popularity in Athens. The Castle is an archaeological site, which offers a magnificent view. This is the Ancient Acropolis of the island and the ruins come from many different historical periods, such as the Classical, the Byzantine and the Venetian. Next to Achili bay are situated the Natural Springs of Nifi, where cold creates a spectacular sight. It is believed that there lived the nymphs. The Archaeological Museum of Skyros is located in Chora and hosts many important findings of the early Neolithic Period. One of the most important archaeological sites at Skyros is Palamari, which is located in the northern part of the island. There were discovered important Neolithic settlements of the Aegean Sea. In Skyros is located the “Skyros Institute of Holistic Studies”, where visitors are offered alternative therapy programmes such as yoga or windsurfing. Skyros has some of the most beautiful beaches in Greece. Crystal clear waters, beautiful landscapes with pine trees almost reaching the sea, sandy beaches or pearly pebbles, you can choose among a wide variety. The most popular beaches are: Molos, Atsitsa, Agios Fokas, Pefkos, Acherounes, Achili, Agios Petros. There are many kinds of cheese produced here like feta, graviera and mizithra. There is also local wine of fine quality, honey and olives. There is also a great tradition in carpenters making wooden furniture with curved decoration. Cheese, honey, herbals, fruits and vegetables, meat, fish and seafood are the main ingredients of the Skyrian cuisine. By air from Athens or Thessaloniki. By ferry boats departing from the port of Kymi in North Euboea or Sporades islands.